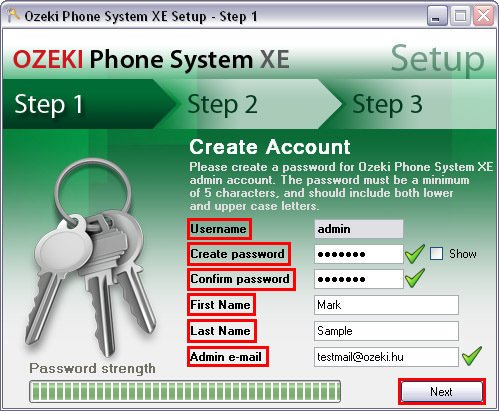 Ozeki Phone System XE is a professional PBX system that provides revolutionary VoIP, SMS and Web functionalities. In order to use the next-generation technology you only need to install the software. The whole process is really simple and only takes a few minutes. After you have finished the installation procedure, your PBX is ready to use. 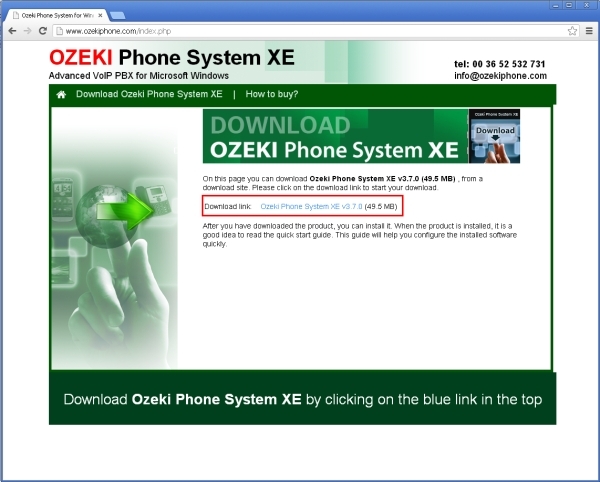 First of all, you need to download Ozeki Phone System XE, from this website by clicking on the red 'Download' button on the top of the screen. (Before downloading the software, it is worth checking the system requirements on the prerequisites page.) 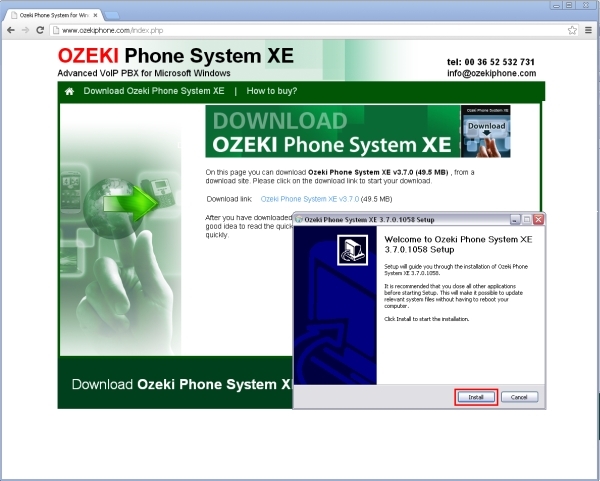 When you have opened the download site, click on the download link (Figure 1). On the next page you need to enter your e-mail address in order to get the download link. After you have typed it, click on the 'download' button (Figure 2). After clicking on the download button, you will get the download link. 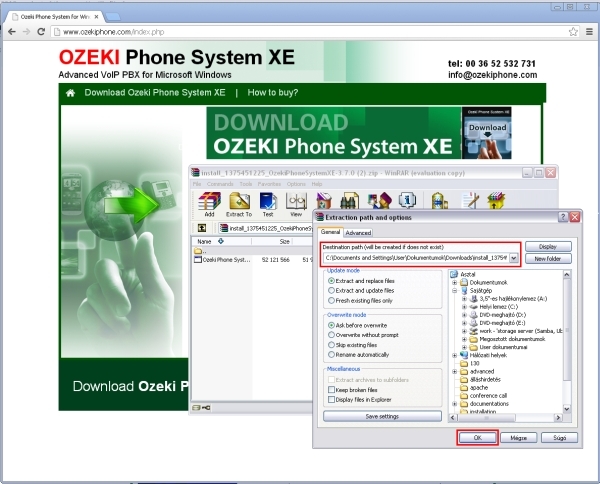 By clicking on it, downloading starts automatically (Figure 3). Now find the installation file and open it. 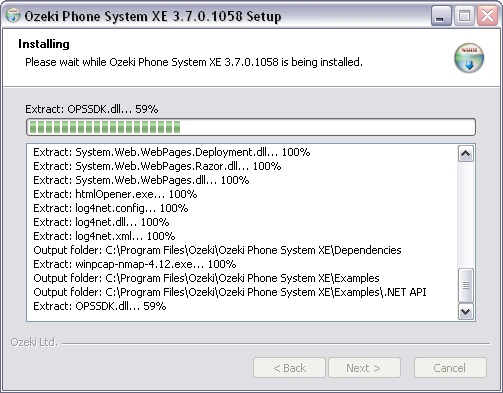 Follow the instructions to extract the installer. Here you need to define the destination folder in which your software will be saved (Figure 4). 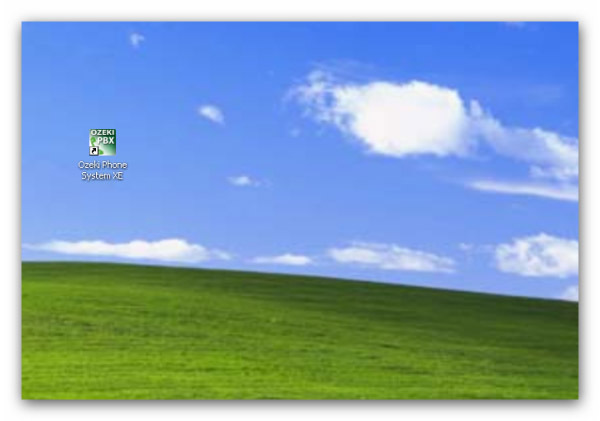 After you have extracted your file, you will find the installer in the folder specified previously. Open it and click on the installation file. The installation wizard will appear, where you need to click on the 'Install' button (Figure 5). Now you only need to wait until it finishes (Figure 6). After you have given all of your account details, click on the 'Next' button. At the next window you need to specify the SMTP server details. It is essential, because the PBX will send notifications about missed calls, conference request, faxes and password reminders. 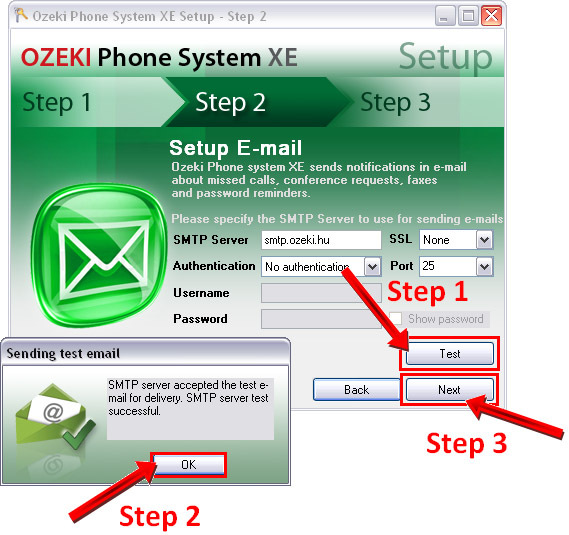 So enter the SMTP server to use for sending e-mails. After that click on the 'Test' button and you will get a test mail to your e-mail address specified previously. If the 'SMTP server accepted the test e-mail for delivery. SMTP server test successful.' message appears, click on the 'OK' button. Now the 'Next' button will be active so click on that (Figure 8). In the next section provide your company details. After you have filled this form, click on the 'Finish' button (Figure 9). Finally, when the installation procedure is over, click on the 'Finish' button (Figure 10). Now your software is ready to use. 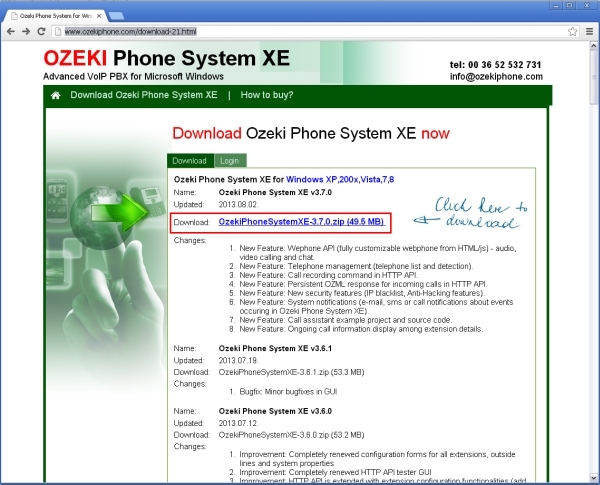 After the successful installation, the icon of Ozeki Phone System XE will appear on your desktop. You only need to open the software by double-clicking on this icon and sign in with your admin account details (Figure 11). The Login screen will appear, where you need to add your username and your password for signing in (Figure 12). 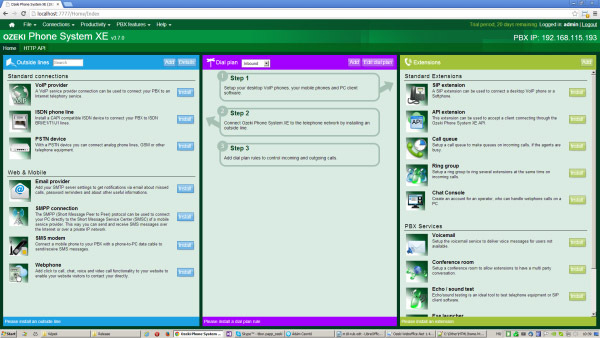 After the successful login, you the home screen can be seen (Figure 13). 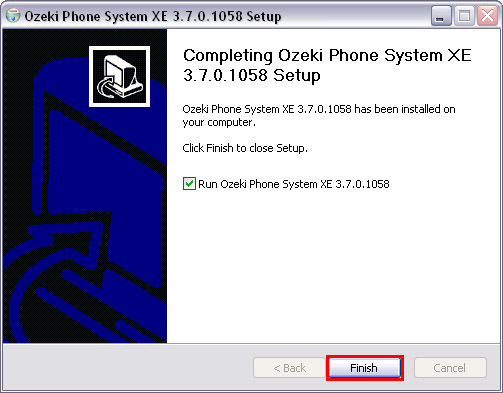 This article demonstrates how to download and install Ozeki Phone System XE on your PC. Now, it is time to configure your PBX. Move on to the next part of the installation guide and connect your PBX to the proper telephone networks.